With food prices on the rise, we common folks are spending a higher percentage of our income at the grocery than ever before. But try your hand at the bulk food bins, and–if you’re anything like me–you’ll feel like a kid in a candy store. 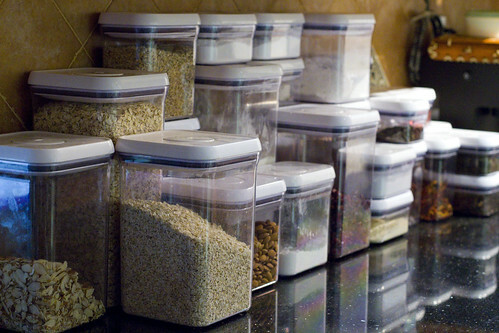 There are dozens of bins, full of healthy, easy-to-prepare foods that cost pennies. Dinner for 6 for under $5? No problem. I have always bought my bulk food items at Whole Foods, but after a weird encounter there, I was encouraged to check out JD Mills. It’s closer to WRP and stocks even more items. I’m not sure if it’s cheaper, but hey–it’s all cheap! I typically purchase dried beans, raw nuts, wheat berries, oats, kamut, bulgher wheat, rice, wheat germ, coffee, flour, barley and more–but try anything that looks interesting. If you don’t know what something is, ask another shopper, or buy it and find recipes on Google. Once you’ve got it home, you’ll need storage containers. I use oxo containers that look great on my counter, but if you have a pantry (which I don’t), you can use something cheaper. Try some the following recipes (all for only a few bucks), and I guarantee, you won’t feel deprived. Cut the orange into segments over the salad and squeeze some of the juice into it. Toast the nuts over a dry pot on medium heat until lightly brown. Add all the ingredients to the wheat berries and mix. Serve at room temperature. On another day, you can toss the leftovers over a green salad. And BTW, I’m fairly sure the bracha on these is “adamah,” but ask your LOR. Pour boiling water over bulgur and let sit, covered for 20 minutes. Drain well and toss with oil, lemon and salt and pepper. Just before serving, add herbs and veggies. Serve at room temperature.